We're seeing a surge in the number of local musicians heading overseas to plant their names and Tapestry is no exception! The Singaporean emo band recently announced that they will be embarking on a jam-packed European Tour this coming July. Starting from 14 July, the trio will be covering Leeds, Nottingham, Salford, London, Brighton, Giessen, Wurzburg and Rokycany, all in a week. Yes, that's one show per day! 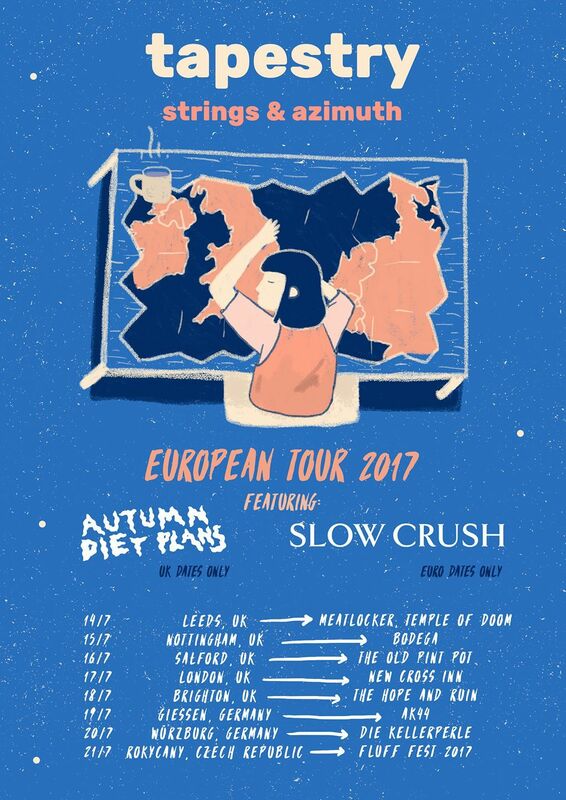 Joining them on the tour are Belgian shoegaze meets postpunk outfit Slow Crush and Nottingham’s four-piece alien-rock band Autumn Diet Plans. Traveling in support of their latest EP entitled our laughter under cerulean skies (a split 9" with American screamo band como regalia), the the tour is aptly named after its opening track 'strings & azimuth'. Listen to 'strings & azimuth' below. Here’s the poster of their tour, and follow their Facebook for more updates.